SlumberBUMP is a leading company in selling Alternative-Therapy for Snoring and Sleep Disordered Breathing. They started as an oral appliance office and realized how beneficial their products were for sleep. They began looking for additional ways to help restore sleep and became interested in how sleeping position influences a good night’s rest. Their vision involves creating happier lives for their patients who snore. Their products are designed with the patient in mind, functional, and are non-medicated with low costs. 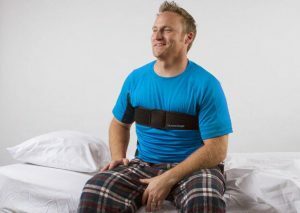 Their most well-known product is the slumberBUMP™ Positional Sleep Belt which acts as a sleeping position trainer to help ensure patients get a better night’s sleep. Around 30% of people aged 30 years and older snore, which can affect both their and their partner’s sleep. For good physical and mental health, you need a good night’s sleep. Continuous sleep disruptions are correlated to higher risks of kidney and heart disease – as well as diabetes and stroke. One primary cause of snoring for patients is vibrations in the airway. For some people, their throat closes partially during sleep, causing air to travel through more quickly. This leads to a phenomenon known as snoring. Obstructive sleep apnea (OSA) is the most common type of sleep apnea and is usually associated with snoring. If you have OSA, your airways are narrower than normal. When you lay on your back, your palate is above your airway. When the throat of pharynx muscles relax during sleep, the palate can fall backward and disrupt their airway. It is not recommended for chronic snorers of those with sleep apnea to sleep on their back or stomach. Doing something as simple as sleeping on your side can reduce snoring and instances of sleep apnea. People can also find they have a reduction in acid reflux and less neck and back pain just by switching their positions. Changing how you sleep can be difficult, but a sleeping position trainer can help you along your journey to better sleep. How these devices work is simple – they prevent you from sleeping on your front or back. Some devices can cause a small vibration that will remind you to adjust your position (without disrupting your sleep) while others physically prevent you from rolling over with applications such as an inflated air bag. It has been found in a position trainer sleep study that sleep position trainers can lead to an increase in sleep quality and overall quality in life. Often, the device only needs to be worn for 30-60 days before sleeping on your side becomes natural. It is a simple product to use and in a clinical study was found to reduce snoring for about 80% of users. Around 90% of users who purchase the device wear and use it at night. The reviews for this product are varied with 41% of reviewers giving it a 5-star rating. The product comes with a one-year guarantee and if you are not satisfied, you can return it within 15 days for a full refund. All the parts are washable and feature non-snag zippers. 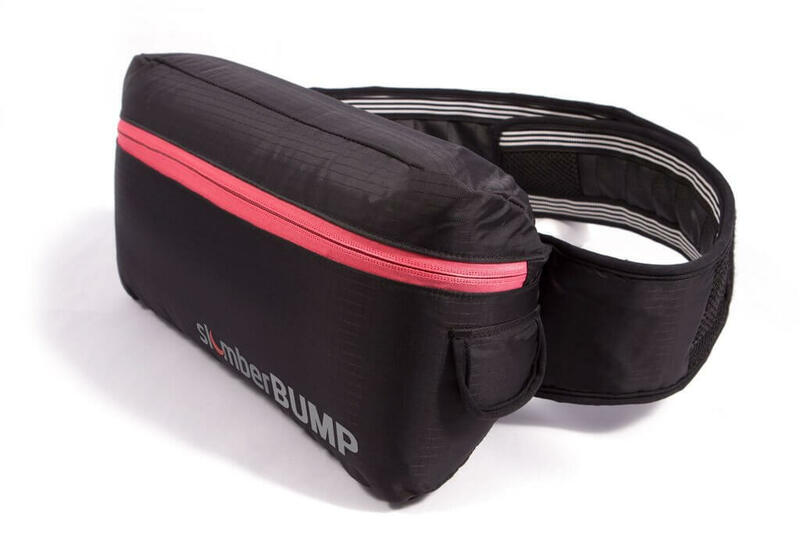 The slumberBUMP is the first position trainer I tried. I ordered it because it seemed like a reasonably priced, and good quality product. There are several other position trainers on the market for those suffering from snoring or sleep apnea, however, some people just tape tennis balls to their back. The product is very light and easy to put on. It requires inflation first, similar to blowing up a beach ball or an inflatable toy. Every few nights it loses a little air, so you will need to add more air when this happens, but it is simple and easy to blow up. Sleeping with the slumberBUMP is challenging. Like most position trainers, it requires an adjustment period. I experienced disturbing dreams all night the first time I wore it. This was likely due to being unable to turn over onto my back. My subconscious didn’t appear to like this. I kept trying the device and I found myself waking up a few times and struggling with the desire to take it off. There’s a reason these devices are called “Trainers” – they take time to adapt and learn to use. If your body is used to sleeping on its back for years and suddenly it can’t, there is going to be some repercussions. The good news is that slumberBUMP does reduce snoring. When used alone, it reduces snoring moderately. 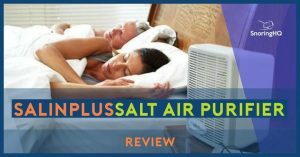 The slumberBUMP enabled me to test several snoring pillows that are for side sleepers and test a variety of snoring products. Using this product allowed me to compare how other anti-snoring devices and aids work for both multi-position and side-sleeping. I found the slumberBUMP was very helpful as a complementary therapy. On its own, it is not a cure for snoring – however, when used with pillows, mouthpieces, TRDs, or other snoring aids, it improves results and makes other anti-snoring devices more effective. SlumberBUMP is a great complementary snoring therapy. It comes as a good price and while it requires adjustment, using slumberBump alone can help reduce snoring, however it is not a cure. Combining it with other anti-snoring devices can have positive results and reduce snoring even more.